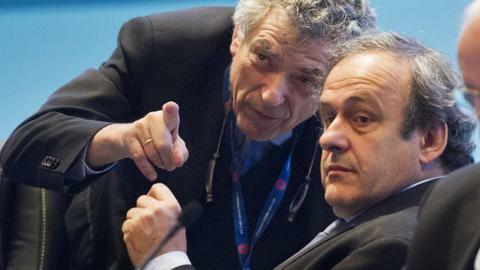 Acting head of Uefa Angel Villar Llona has escaped a ban for not co-operating with investigations into the 2018 and 2022 World Cup bids. The Spaniard, who led the joint Spain-Portugal bid, was warned and given a 25,000 Swiss francs (£16,377) fine. Fifa also banned Congolese Football Association vice-president Jean Guy Blaise Mayolas and general secretary Badji Mombo Wantete for six months. They had been provisionally suspended so will serve the remaining 45 days. Villar Llona is also the president of the Spanish football association and a vice-president at world football's governing body. He has stepped in for Uefa chief Michel Platini while the Frenchman serves a 90-day ban from all football-related activities. German football legend and Fifa member Franz Beckenbauer is also being investigated for his refusal to co-operate with the inquiries into the vote that handed the 2018 and 2022 tournaments to Russia and Qatar. Congolese pair Mayolas and Wantete were handed six-month provisional bans in June this year. They were found guilty of apparent breaches of Fifa's code of ethics.